A must have racing accessory for every serious racer! This is the very first wireless Bluetooth display unit officially licensed for PlayStation 4! Thrustmaster BT LED Display features 15 built-in LEDs for tachometer function (RPM), 6 marshalling LEDs, a central numeric display area indicating gear number, and left and right alphanumeric display areas! 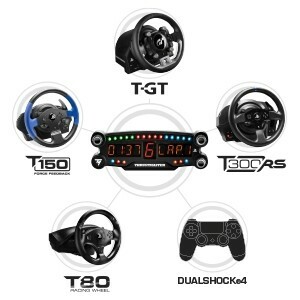 The BT LED Display is compatible on PlayStation 4 with the recommended Thrustmaster racing wheel models: T-GT, T500 RS, T300 Series, T150 and T80 and also with DualShock controllers. 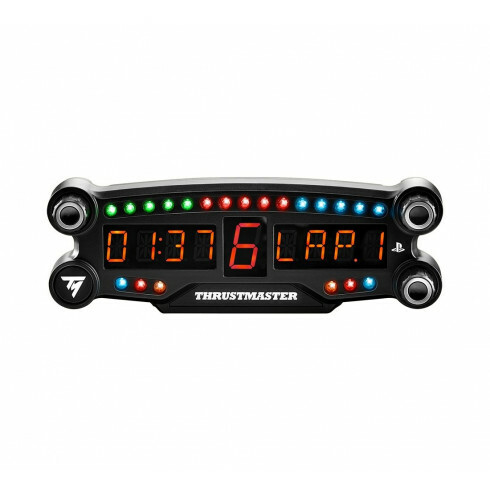 Keep ahead of the pack with Thrustmaster BT LED Display! Exclusive and officially licensed for PlayStation 4. Featuring a central numeric display, and left and right alphanumeric display areas (each with 4-character x 14-segment displays). 15 tachometer LEDs and 6 marshalling LEDs. Designed for use in racing games only; either with T-GT, T500 RS, T300, T150 and T80 Thrustmaster wheels or with the DualShock 4 controller. Li-ion 3.8V 2600 mAh battery is rechargeable via micro-USB cable, 24-48 hours of battery life. The BT LED Display is an exclusive device officially licensed for PlayStation 4 systems. The BT LED Display is compatible on PlayStation 4 with the recommended Thrustmaster racing wheel models: T-GT, T500 RS, T300 Series, T150 and T80, and also with official PS4 DualShock 4 controllers. A central numeric display area indicating gear number. Left and right alphanumeric display areas with 4-character and 14-segment displays. 6 warning/marshalling LEDs positioned at the left and right of the unit. 3 rotary selectors with push button. Its Li-ion 3.8V 2600 mAh battery is rechargeable via micro-USB cable: from 24 to 48 hours of battery life.